Easy baked fish sticks: This recipe uses little to no oil, keeping them low in fat but still has great texture and flavor and easy to make! Click here for recipe. Turkey, rice, veggie soup: Simple, tasty, and comforting. Click here for recipe. Breakfast taco: Fill a small (corn or flour) tortilla with 2 egg whites scrambled with handful spinach, wilted and top with 2 Tbsp. shredded low fat cheese. Season as desired and enjoy! Topped rice cakes: Spread 1 Tbsp. smooth nut butter on rice cake; top with banana slices and sprinkle of cinnamon. Simple Spaghetti Squash: click here for recipe. Preheat oven to 425 degrees Fahrenheit. Spray 2 baking sheets with cooking spray. Rinse and scrub sweet potatoes in water. Slice into fry shaped strips (1/4 – ½ in. thickness). (Leaving the skin on keeps in the fiber!) Put onto baking sheets. Drizzle with olive oil (about 1 Tbsp.) and toss; spread back out onto baking sheets. 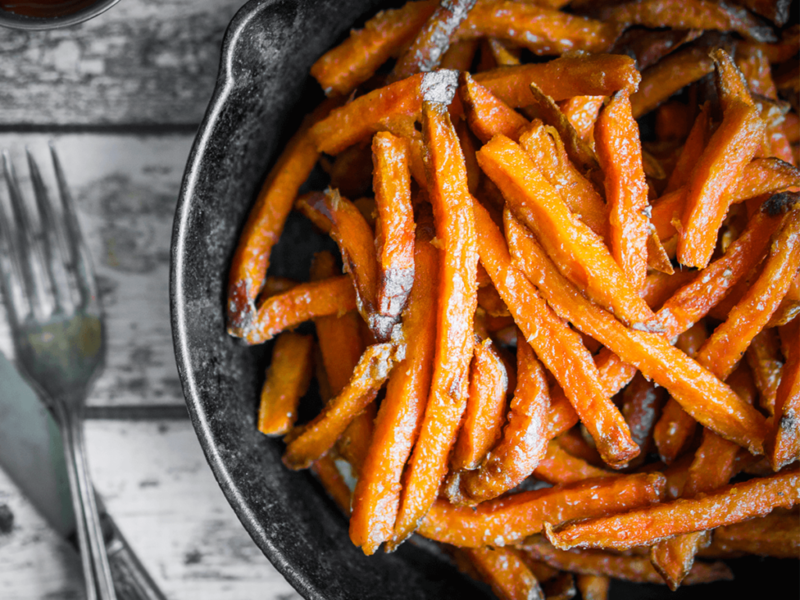 Sprinkle seasonings lightly over sweet potato fries. Use as much as desired. After you have made these a few times you will find your perfect balance! I hope you love the combination of garlic, chili powder, oregano, and salt as much as I do. Bake in the oven about 15minutes. Times vary depending on your oven and the thickness of the fries. The fries with be slightly soft and browned on the baking pan side. Remove with spatula onto a serving plate or bowl. Enjoy!